We never really grill hamburgers in the backyard. Not when there are In-N-Out Burgers and Burger Lounge scattered about (I might admit to liking Burger Lounge better than In-N-Out, but don’t tell anyone, I might lose my Official California Native status, so, shhhh!!). When it comes to throwing something fast on the grill I prefer bratwurst ANY day to burgers. Think about it- there is way more greasy goodness to be had in a brat- no bun, please, that gets in the way of enjoying the grease. Bratwurst, pork chops and loins, steaks of all kinds, and a really great copy-cat recipe of El Pollo Loco’s chicken** are regularly on my grill, plus lots of vegetables with olive oil, salt and freshly ground pepper. Yum. 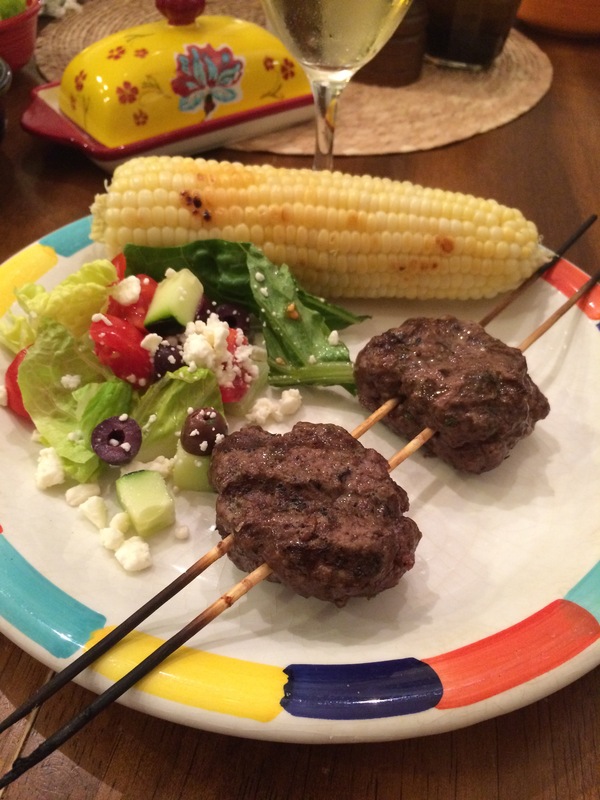 How about trying a Mediterranean-style kebab for The Husband, who actually does like backyard burgers? For tonights’s kebabs, I followed the best recipe that I found online… just kidding. I did a mix-mash of about four different recipes. 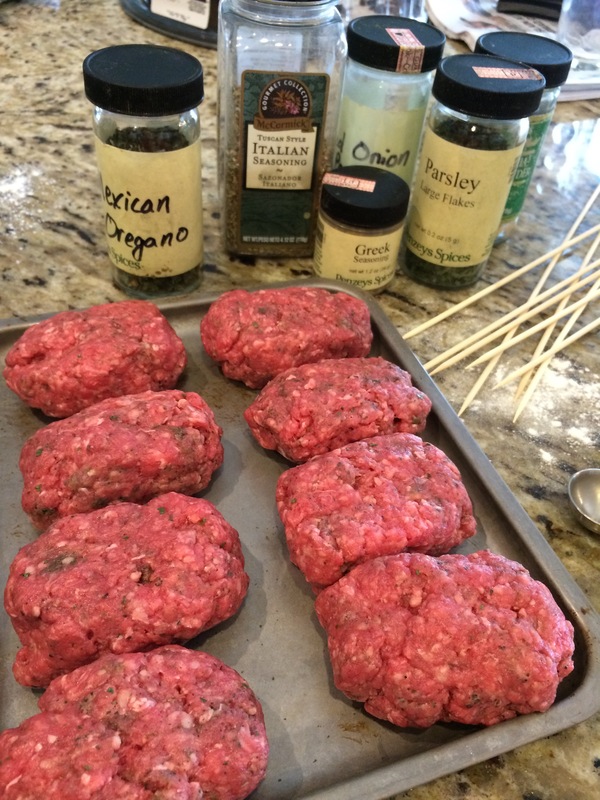 1/2 tsp each of onion powder, garlic powder, salt, Italian seasoning, ground pepper, and Greek seasoning mix. Next, I sat down to type this post. Two minutes later, I ran back to the kitchen and chased the cat off the counter, and promptly wrapped the kababs and put them in the fridge. Grilled on low heat around 10-15 minutes to about medium rare, these were GREAT! The Grill Master chose the low heat because these were fairly thick, and didn’t want overcooked kebabs. We served them with a home made Tzatziki sauce (plain yogurt, crushed clove of garlic, grated cucumber, dill, salt, yum). The Husband wants them in the regular line up. The Girl liked the kebabs, too, but she put ketchup on hers. What a plebe. The Boy says “Good, but could use more seasoning,” which is a surprise, since I thought there might be too much spice for the Prince of Plain. I think they would be far better made with half ground lamb, much like the most authentic recipes. Really- get this little gem of a cookbook! 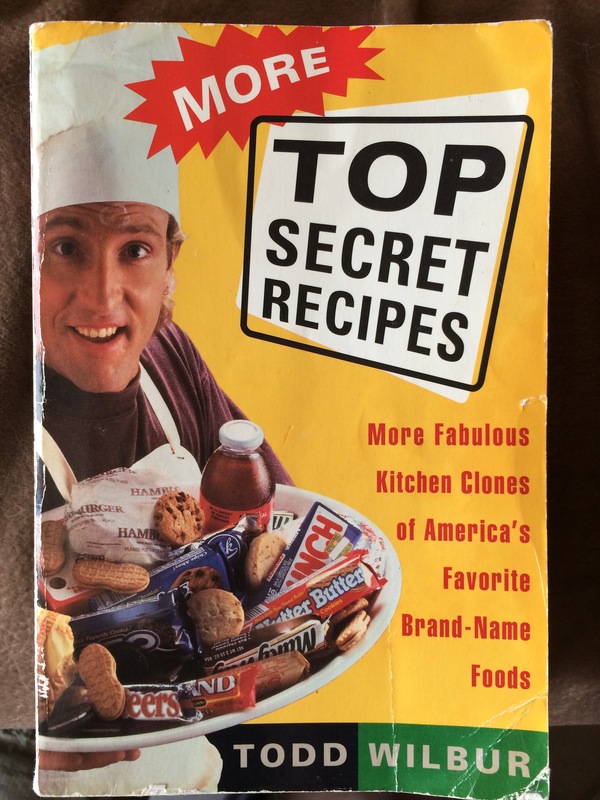 **Note- Speaking of the “More Top Secret Recipes” cookbook, by Todd Wilbur, I highly recommend it. This book is worth the purchase price if only for the Cinnabon Knock-Off and El Pollo Loco Chicken recipes. And I guess I like both spellings of the word “kebab/kabab… and didn’t realize I had used both until my mom (also known as my editor) pointed out the inconsistency. Have I ever mentioned that I can’t spell in three languages? I’d pay for Spell Checker if it weren’t free.